NM Engineering Adjustable Sway Bar Endlinks for R50, R52, R53, R55, R56, R57, R58, R59, R60 MINI Cooper (base and S models) are available for either front OR rear (front available in standard OR the shorter 'SPEC-B' 1.5" shorter) applications. See drop down menu for options. Everything starts with the material – after all, it is the foundation of the part. NM Engineering did not skimp here as these links are precision CNC machined from 7075-T6 aluminum in California. Because this is a high-stress part, 7075 was chosen because it has the same tensile strength as steel, yet is much lighter. Just to compare, 7075-T6 has almost twice the tensile strength compared to 6061-T6. Another benefit afforded by 7075-T6 is it allowed NM Engineering to machine or turn-down the centers of the links to save weight and stay clear of elements such as brake lines and brake pad sensor wires. To give you an idea how thin the link is, the centers of the NM links are thinner than a standard AA battery. By the way, a quick note on the materials used…whether it is 6061-T6 or 7075-T6, all grade materials purchased are certified. Uncertified scrap or overrun materials from metal/alloy vendors is NEVER used. 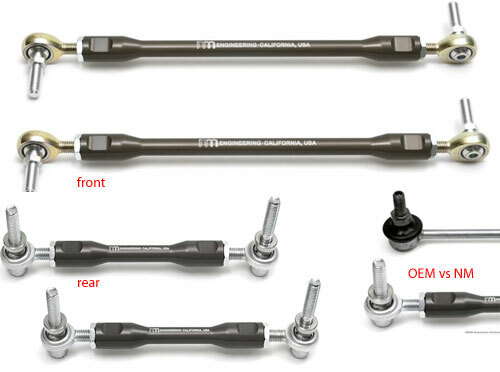 NM Engineering’s Rear Adjustable Sway Bar Links will not yield like their OE counterparts making sure that all suspension movements are transmitted to the sway bar for maximum performance. This part is a must, especially on lowered vehicles or cars equipped with aftermarket sway bars.